Staffhacker is on a semi-permanent hiatus. Staffhacker is a site dedicated to resourcing and training campus ministry staff by providing them with technology and productivity tips. The goal of our site is to equip campus ministry staff to fulfill their callings efficiently, excellently, and with a minimum of distracting administrative responsibilities. As someone who has experience raising funds for full-time campus staff work with InterVarsity Christian Fellowship, I found myself often struggling with how to handle the myriad responsibilities of a campus staffworker. I’ve been a fundraiser, a mentor, a speaker, an administrator, a web publisher, an event organizer, a liaison to student government bureaucracy, an employee of a large national organization, and much more. It’s more than I could take on by myself, and my inability to use my time and tools well became very clear very quickly. I decided that when I find a tip or a tool that helps me spend more time in ministry–and less time floundering around with to-do lists and new technologies–I wanted to share it with other campus ministry staff. It quickly became apparent that where my sharing could be helpful, a sharing community would be exponentially so; the result was Staffhacker. The name is a reference to Lifehacker, one of the Internet’s premier productivity & technology web sites. Because of my editorial bias, the posts on this site might tend more toward parachurch ministry staff who raise their own funds; but our goal is to create and collect content that’s valuable for as large a segment of college- and university-related ministers as possible. Matt is a web developer and the part-time Communications Coordinator for the Multiethnic Ministries Department of InterVarsity Christian Fellowship/USA. He also runs Karani, a cloud-based tool for fundraisers. Adam oversees a team of writers, as well as video and web projects, as the Associate Director of Communications at InterVarsity Christian Fellowship. He thinks a lot about strategy, given changes in technology and cultures. He’s also a photographer and a writer–as a regular contributor to Relevant Magazine, as well as diverse rags like Overland Journal, The Gardener, Country, MOMSense, and RoadBike. He rides motorcycles, reads like a banshee, and creates elaborate Jell-O desserts. You can find him on Twitter and his blog. Berry is the North Florida Area Director for InterVarsity Christian Fellowship/USA. Brian Barela is the Director of New Media for Campus Crusade for Christ. He blogs at brianbarela.com, founded the RE-Think Blogference, and contributes to MediaforMinistry.org. Brian works for InterVarsity Christian Fellowship. Brian loves trying new restaurants, eating great food, playing interesting games and spending time with his wife and daughters. Gordon is the Public Media Coordinator for InterVarsity Christian Fellowship. Micheal is the blogger for the Emerging Scholars Network and the Communications Manager for the Scripps National Spelling Bee. Barney is a Campus Staff Member with InterVarsity Christian Fellowship/USA at the University of Chicago. 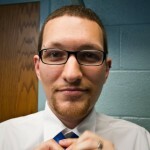 Dave is one of the Campus Staff Members for InterVarsity Christian Fellowship/USA at the University of Michigan. He and his wife Jen live near Ann Arbor with their dog Caspian. He is most happy when in the woods and is inspired greatly by Thoreau’s Walden and Maclean’s A River Runs Through It. Brian is an innovator and a creative thinker and a former Campus Staff Member with InterVarsity Christian Fellowship/USA at Northern Arizona University. Steve is the South Florida Area Director for InterVarsity Christian Fellowship/USA and blogs (almost) daily at yosteve.blogspot.com. Staffhacker is powered by WordPress, running a theme created from scratch for Staffhacker by Matt Stauffer. The social media icons are from Paul Robert Lloyd, and the inspiration for the site and the name come from Lifehacker.